Zachary Fox comes from Cornwall. He studies at the Sylvia Young Theatre School in London. Though fouteen, he has had extensive theatre, TV, radio and film experience. He played Ralph in Richard E Grant’s Wah Wah, the young Casanova in the TV production, and Weston in Tom Brown’s Schooldays, also for television. 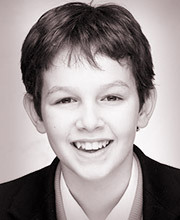 He was Louis in the UK tour of the musical The King and I, and Fleance in Macbeth for the RSC.